Ahhh…summertime. Warm weather means outdoor sports, vacations, exercise and …shoulder injuries? That’s right, shoulder injuries. Many classic outdoor activities during the summer months are “overhand/overhead” ones like baseball, softball, tennis, swimming volleyball or even painting, roofing and yard work. While all these activities use different muscles, they all involve repetitive use of the shoulder that can lead to potential shoulder instability (when the shoulder joint is loose and slides around too much in the socket). This repetitive motion can cause the shoulder ligaments to loosen and in some cases, slip out and dislocate or lead to arthritis. Frequent use of the shoulder can also cause severe problems with the rotator cuff. The rotator cuff is the name for four distinct muscles and their tendons that surround the shoulder, that provide strength and stability during motion. Some of the most common shoulder conditions to the rotator cuff that can occur in the warmer months include impingement syndrome, bursitis, tendinitis and tendon ruptures or tears. All of these can vary in severity and if ignored, can aggravate the shoulder even further. 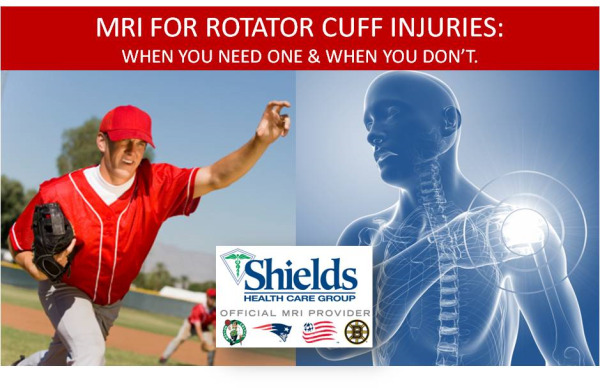 One of the top injuries that we see at Shields MRI during the summer season is rotator cuff tears. So how do you know if you have a rotator cuff tear and if you need an MRI? First thing is first –any concerns, sharp pains or prolonged discomfort is a reason to visit your doctor; and a doctor that specializes in orthopedics is one that can help address concerns with your shoulder and rotator cuff. MRI is particularly beneficial for internal organs, muscles, connective tissue and the central nervous system and uses cross-sectional imaging to create extremely clear and detailed picture, allowing your physician to make an earlier and accurate diagnosis. In the instance of a rotator cuff injury, your doctor may recommend an MRI not only to diagnosis a tear, but rather, to exclude the possibility of one. 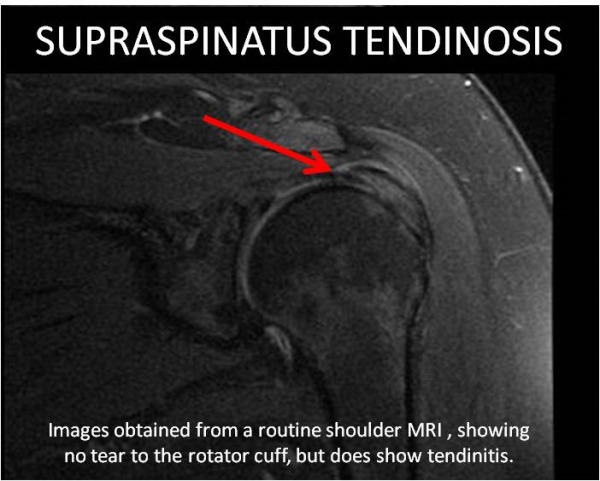 Not all shoulder pain and injury to the rotator cuff is cause for an MRI. Dr. Noerdlinger explains, “Only three things will limit external rotation: arthritis, a posteriorly dislocated shoulder and frozen shoulder. Both arthritis and a posteriorly dislocated shoulder can be diagnosed on plain x-ray. The best way to evaluate for a frozen shoulder is to assess the external rotation of a patient's glenohumeral joint. A frozen shoulder is the presumed diagnosis in the setting of normal X-rays and limited external rotation." If your doctor does recommend an MRI for your shoulder, there are two potential types of MRI procedures that can be used to diagnose a rotator cuff tear: A routine shoulder MRI, which takes about 25 minutes of actual scan time, and shoulder MR arthrogram, which involves an X-ray procedure during which contrast is injected directly into the shoulder joint space followed by an MRI. 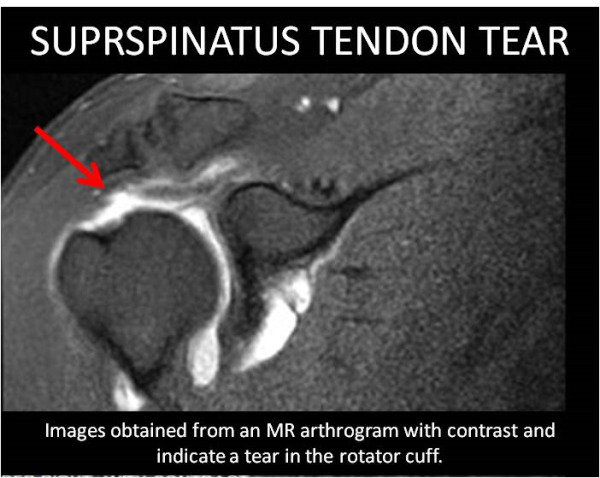 An MR arthrogram is more specific for shoulder joint injuries, but is also more involved and requires the patient to be at the facility for about two hours. Your doctor can help determine which scan is the right one for your injury. 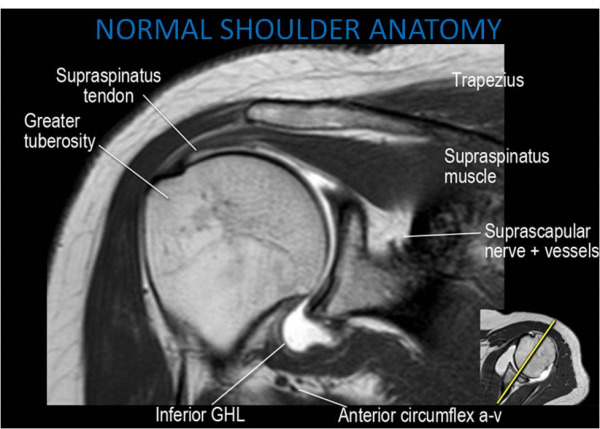 Example images of shoulder injuries for both types of MRI scans are shown below. If you are experiencing any pain that is consistent with the descriptions in this article, you may want to consider a visit to your doctor, who may recommend therapy, rehabilitation or an MRI. The biggest lesson is to listen to your body and your doctor. And if we see you at Shields MRI, we’ll do everything we can to get you back on the playing field without further pain or injury.